Week 4 – Trying to keep control.. So it’s week 4 and feel like I need to disclose the fact that we have two houses in addition to my parents house and my house. Let me also start by saying that hoarders should never have more than one house. To make it clear, the first “other house” is referred to as across the street for the obvious reason that it’s across the street from my parents house. This is the house my father grew up in. It was originally built as a two room war era house, but my grandfather added a living room, additional bedroom, and an attic onto the original structure. Since then, my parents, paternal grandmother, brother, and myself all lived there at one point or another. I had intentions to remodel it and move in after college, but part of the house is on a dirt foundation and it needed a lot of work. I decided that I would rather buy my own place instead. The house has been vacant since then and the final goal will be to clean the house out and have it knocked down. Since I hadn’t been across the street in a while, I decided to stop over and assess the situation. Looking around the downstairs area, there are cobwebs everywhere and bottles, cans, and other recycling left from my brother some 7 or 8 years earlier. Then I step upstairs into the attic, this is a particular problem area because the 60 year old insulation is falling and has covered everything in a gross brown dust. I quickly grabbed some pictures, jewelry, and documents, but realized most were from my grandmother’s second husband whom I never met (all of my grandfathers passed away before I was born.) I took a small box of my grandmother’s things and called it a loss. There was more work to do at my parents’ house. So onto our favorite topic. Newspapers!! Earlier this week I received a call from my mother telling me that she was going to recycling and that she was bringing the two bags of newspapers she packed up along with her. I pause and ask hesitantly “not three?” Now she gets snippy with me, my mother replies “No! Not three! I am telling you the truth! I was only able to get two bags” (as if there just weren’t enough newspapers to ever pack up three bags.) I try to emphasize the fact that the whole point is for me to come and get them. She asks if I just wanted her to leave them at the house and I reply yes. So I head to my parents house and realize that my mother has taken the newspapers to recycling herself “since she was going anyways”. I don’t know if I believe her or not, so I’m not counting them this week. I ask about the third bag and she gets snippy again. I get a response along the lines of “don’t push it.” I attempt to take a bag of something else. Clothes maybe? Surely there aren’t enough of those either. Only all of the clothes that we have ever worn since we were babies! Once again she says “don’t push it.” I go upstairs and start piling up some boxes I went through the week before to take out. 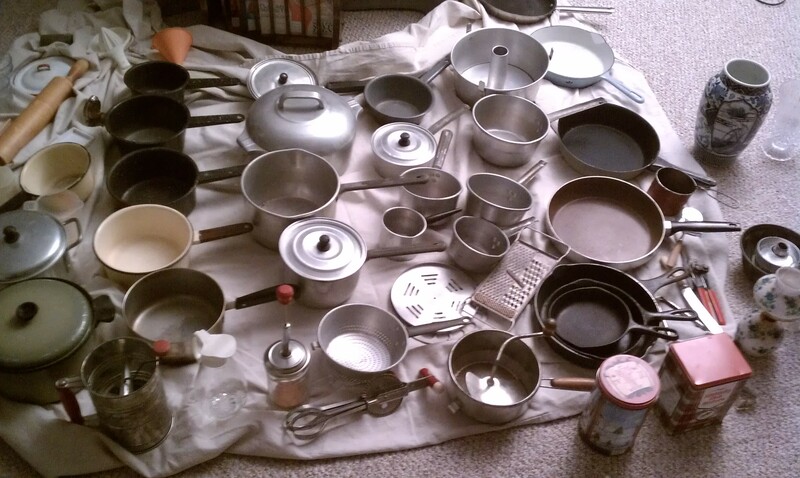 They are mostly pots and pans from my grandmother and great aunt who both passed away a few years ago. My mother is watching me the whole time and is trying to go through everything I put down. I tell her I will take everything and lay it out at my place so she can see it. She points out one contraption she thinks is “antique.” Ugh! I finally get everything out and grab two bags of milk cartons to make up for not taking any newspapers. Supposedly she keeps milk cartons so she can store food for the compost before bringing it outside. She also said she would like to keep a few to make some houses with the grandchildren. No way whatsoever!! I practically grab the bags and run. Finally I get home and lay everything from the boxes out on a blanket on my living room floor. I count about 27 pots and pans. Most are old and aluminum. They will probably be going to goodwill. My first haul from my mothers’ house. Lots and lots of pots and pans. I decide to sort everything between good and bad piles. Mixed in are some old kitchen tools and tins that would look pretty cool together on some shelves, so I put those aside. I doubt they are antiques, but they have some character to them. Otherwise, I am excited to find some really nice iron clad skillets. I will definitely be using those! I have my mother come over the next day to sort through everything with me. This is important so I can gain her trust and let her know I’m not getting rid of anything valuable. I am also including her in the decision-making process. I tell her that I’m unsure of what goodwill may do with some of the older pots (some aren’t in the greatest of shape.) I was going to bring them to recycling, but she insisted that they could be worth some money so she would like to bring them to the metal guy. Great. She ends up taking about 10 of the pots. I put aside some of the nicer pots and bring the rest to good will. *as a side note, I got a call from my sister in-law about a week later asking why there was a box of pots in my mom’s trunk. Obviously they haven’t made it to the metal guy yet. Sigh. 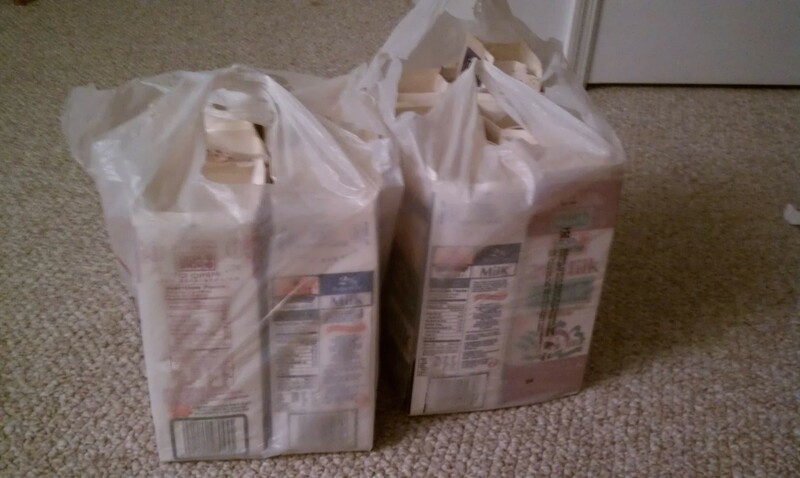 2 bags of milk cartons. Week 3 – Upping the Ante – Or Not?? Since I started this “challenge” of sorts, I have had high aspirations that my mother will see the progression we have made and will slowly want to contribute more as time passes. On the contrary, I’m guessing my mother hopes that I won’t show up anymore. I figure that we are going to have to clean up the house at some point, so I might as well make it easier for myself in the long run. In the end, I’m hoping she will not resist as much as she has in the past. My mother is a stubborn person when she wants to be. Since she has such an attachment with newspapers, I figured they would be the easiest item to follow in terms of goals. Not to mention, they are everywhere! This week I decided to hand my mother 3 bags to fill with newspapers (I’ve been giving her two for the past two weeks). I’m not sure how she’s going to react to this, but I’m surprised when she takes the bags and agrees. By “agrees”, I mean her giving me a look like you have to be kidding me and and then letting out a long sigh. I’m interested to see if she actually fills all three bags. I’ve been trying to use a more positive approach towards my mom throughout this process, so I’ve decided to be ridiculously enthusiastic and supportive this week. If you know me, this is not normal in any way. My mother saw through this front immediately, but I tried to be supportive, “Yeah! !, You have done SO well, One more bag would be great! !” Needless to say, she was less than amused. I let her be with her newspapers and went upstairs to check out what was the only clean room in the house when I moved out 5 years ago. This will be referred to as my brother’s room, since it was his room while we were growing up. As soon as I walk into the room, my nose begins to run from all of the dust. I climb over boxes and random items that are haphazardly placed around the room to some boxes piled up in the corner. I find a bunch of old pots and pans from my grandmother and great aunt’s houses. Unfortunately there are boxes and bags of seemingly valuable items teetering everywhere. I decide it’s best to leave them for now. Eventually my mother joins me upstairs and carefully eyes my every move. I explain that there are a lot of items I would like to take to my house to sort through. She responds with the fact that most of the breakable items (about to crash to the floor) are worth money. She has avoided responding to the fact that I want to take items out of the house. In the end she has not said no. I see this as a positive response, grab a box of my old stuff, and head downstairs. At the bottom of the stairs, I find the two bags of newspapers I had asked her to fill. One of the bags is partially filled with some sort of packing paper. I ask if this is a rebellion against me for requesting three bags next week. Once again, she is not amused. I take out the filler and ask for more newspapers, this is not acceptable!! She proceeds to slowly go through additional newspapers one by one to put in the bag. As I wait I tell her about a news story I read earlier about a woman who was found dead under her collapsed piles of “stuff.” http://www.dailymail.co.uk/news/article-2101763/Hoarder-Margareta-Scheibe-72-decomposed-bags-trash-piled-ceiling-home.html I receive the death stare. Well then, I scour the room for some non-newspaper Items that she may be okay to part with. I find some old microwave meal boxes sitting in a pile and ask if I can take them. She responds that you can enter the codes online to get free boxes in the future, but she hands me a pile of boxes who’s codes have already been entered. Score!! I feel victorious. Dad is asleep, so nothing on that front. Oh well. Week 2 – Is this really going to work?? We have reached week two! You might be wondering how my parents feel about the fact that I am posting intimate aspects of their lives online. At this point, they have no clue and I’m not planning on them finding out any time soon! You see, I have a very good relationship with my parents as long as we don’t talk about their house. We can have a great day or weekend and I would love to bring up topics such as cleaning the house, but I feel like it would ruin a really good day. I talk on the phone with my mother at least once a week and sometimes every day. For this reason, it is extremely hard not to tell her that I’m documenting our trials and tribulations every week with all of you. Trust me, I feel so guilty. In the end, I am not trying to embarrass or shame them with public humiliation. I have felt alone in this situation for so long that it brings comfort to share my story. So for this reason, I will try to share as much of this process without disclosing names or locations for their privacy. As I proceed, I will be adding pictures and mentioning conversations which may seem a bit personal. I am posting these as I hope to show the progression of our journey. Am I scared of my parents’ reaction if they ever see this? Absolutely, tears well up in my eyes imagining it. So mom, if you find this one day, I hope you can respect the fact that I wanted to share our story as a way to help others who may be in a similar situation. Hopefully by the time you see this, you can look back and be proud of how well you have done! So we are onto our second week! Last week I handed my mother two paper bags to fill with newspapers and told her I would be back for them in a few days. I wasn’t sure how she would react and I’m a bit nervous as I walk into the house. To my surprise, I see the filled bags sitting in the front hallway. My father is sitting at the counter watching TV while my mother is nowhere in sight. He states that my mother is upstairs talking on the phone. I take this as my opportunity to fill the bags up a bit more. Of course, I can’t take a whole bunch of newspapers from the top of a pile and throw them in the bag. She would notice. I proceeded to run around the house attempting to find a few papers from each pile to fill up the bags. This proved to be similar to a game of Jenga, as pulling even a single paper from a pile would cause it to teeter and almost fall to the ground. That would be bad. Since my mom wasn’t around, I took the chance to discuss what I was doing with my father. Now mind you, my father is a whole different ballgame. He is frustrated by my mothers’ clutter, but has an equal amount of clutter of his own. His clutter is normally bigger (full cabinets and disgusting furniture from who knows where) and hot wheel cars among other things. Did I mention lots of hot wheel cars? Anyways, he seemed very enthusiastic about the fact that I am trying to help my mother out. Unfortunately, he would rather hire a dumpster and get rid of everything immediately. I would love to do this as well, but I have learned that I have to go at a slower speed to make sure my mother doesn’t feel overwhelmed. I slipped in the fact that I would also like to work on removing some of my fathers’ items as well. He seemed very eager to help. This seems like a promising progression! Maybe my parents have turned a corner? Until next week..
Week 1 – Starting the clean up!! For as long as I can remember, it has been a constant battle to get anything out of my parents’ house. Getting my mom to clean up the clutter wasn’t an option. When I used to live at home, even a quick suggestion about cleaning the house would cause her to shut down completely and walk away, ignoring me. Of course this infuriated me, I would start screaming and crying, getting us nowhere. Normally I would resort to cleaning up the house behind her back, which would lead to an argument when she figured out something was missing. My father was actually an accomplice at one point, taking garbage to a dumpster for me. That is, until she caught him. I was almost relieved that we had been caught; we had been sneaking out garbage behind her back for a few months by that point. I almost wanted to tell her, expecting her to be happy with the fact that I was trying to help. Instead she got angry for a few days and then seemed to forget about it and wanted nothing more but to ignore the situation. So now once again, I have decided to help my parents, coming in with a bold approach. I walked into the house with two paper bags from the grocery store, handed them to my mom and told her she would have to fill them before I left in about an hour. She complained, but I mentioned a recent house fire where the family was not able to get out in time. Unfortunately, my father isn’t of the best of health, and I mentioned that if anything happened in their house, they probably would not have time to get out before the thousands of newspapers quickly went up in flames. Meanwhile, I went upstairs to my brothers’ old room to assess the clutter that has accumulated since I moved out. There were lots of bags and boxes filled with items from my great aunt, grandmother, and mother. Yeah, it’s going to be a lot of work. After puttering around for a bit, I went back downstairs and my mom had barely filled the two bags. Ultimately, I was impressed that she actually made an effort to fill them, so I couldn’t complain. I warned her that I would be leaving two bags for the next week, so it would be best if she started putting newspapers aside throughout the week. I have to say, I left with a slight sense of joy in my accomplishment of actually getting her to comply with two bags. It was the smallest step ever, but it worked. I patted myself on the back and had a huge grin on my face the whole way home.